Good morning! First, I want to apologize for not responding to the post comments as quickly as I normally would have, but my family and I were away for the week on vacation. I do hope you enjoyed last week’s recipes and thanks again to Katrin from Running with the Devil(ed) Eggs for coming back to help me with a guest post. I don’t eat much bread. Really. I don’t eat sandwiches so there is really no need. So when I do splurge, I prefer a nice, crusty Italian or Ciabiatta heated up in the oven; then dip it in extra virgin olive oil with a little salt and pepper. Which was what I was planning to do with this particular loaf, until I looked at my fresh basil and it was starting to see better days. 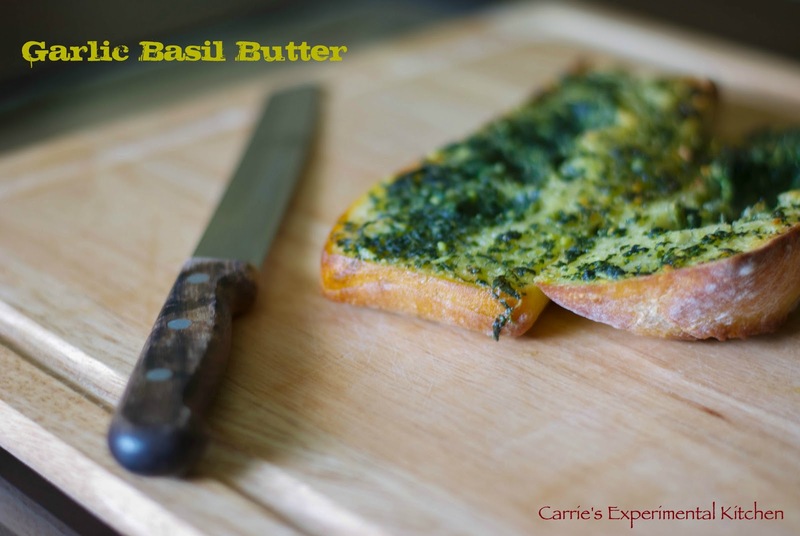 I hate to throw anything away that is still viable and knew I wouldn’t be making anything with it in the next day or two, so I blended it with some garlic and butter to make this Garlic Basil Butter to top my bread with. O. M. G. This was even better than the olive oil, but healthier…I don’t think so! Thank goodness I don’t splurge like this very often because I could have easily made a really bad habit out of this bread! This butter would also go nicely on some corn on the cob or mixed in with cooked pasta. Add the basil, butter and garlic to a food processor and blend until smooth. Cut the loaf of bread in half horizontally; then spread the mixture evenly on both sides. Wrap the loaf of bread in aluminum foil. Bake at 350 degrees for 8-10 minutes or until butter has completely melted and the bread is warm. Cut into 8 slices. This looks so delicious–and I bet it freezes well, too, in case you have the self restraint not to lick the bowl clean.